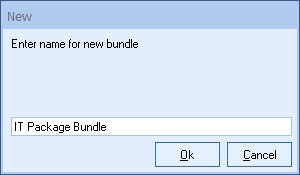 To setup a bundle, select the Products -> Bundles menu or the icon from the icon toolbar. Click on the [Ok] button to save the bundle name. Note: The Bundles window can be resized. The last size and location will be remembered (per user) for the next time. Note: You cannot create bundles within bundles. You can, however, include a bundle in a simple configuration. Users can search for Bundles via the Search by Name field by either searching for the exact Bundle name or by using the begins with, contains, ends with, and Search Query fields. Tip: When using the Search Query operator, use double quotes [ " " ] around a phrase to search for that phrase. If you type a minus [ - ] character after the phrase, the search results will omit anything typed after the minus sign. For example, if you wanted to search for any bundles that contained "Microsoft Office" in the phrase but didn't want it to include results that have "2007" in them it would look like this: "Microsoft Office" - 2007. If you typed "Microsoft Office" -Basic - OEM this would omit any results that contain the word "Basic" and/or "OEM" after Microsoft Office. 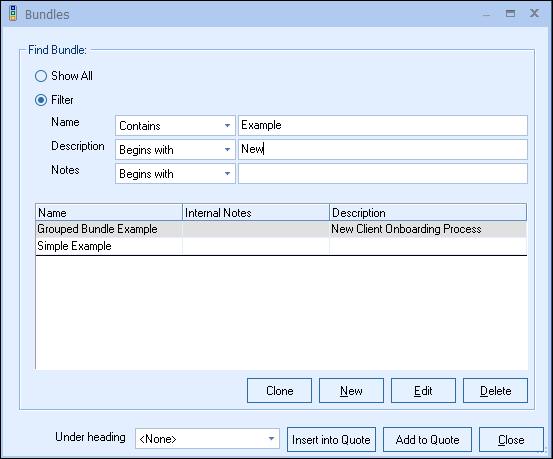 In order to add a bundle to your quote, click on the Bundles icon from the icon toolbar. Select the bundle you want to include in the quote, and click on either [Insert into Quote] or the [Add to Quote] button. 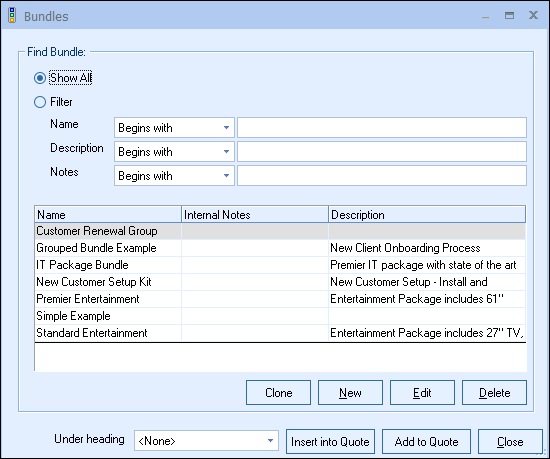 Inserting the bundle will place it above the selected line on the Document Items tab; adding the bundle will place it at the very bottom. A window will appear that will ask you how many of this bundle you would like to add; enter the appropriate number and click Ok.
You can also select multiple Bundles to add at once by holding the CTRL key on your keyboard to select specific bundles or the SHIFT key to add a contiguous list of bundles.